I’ve finished the Korean Liar Game and I’m a couple of episodes away from finishing the Japanese Liar Game. I must admit my attention is waning. Sometimes you can have too much of a good thing. 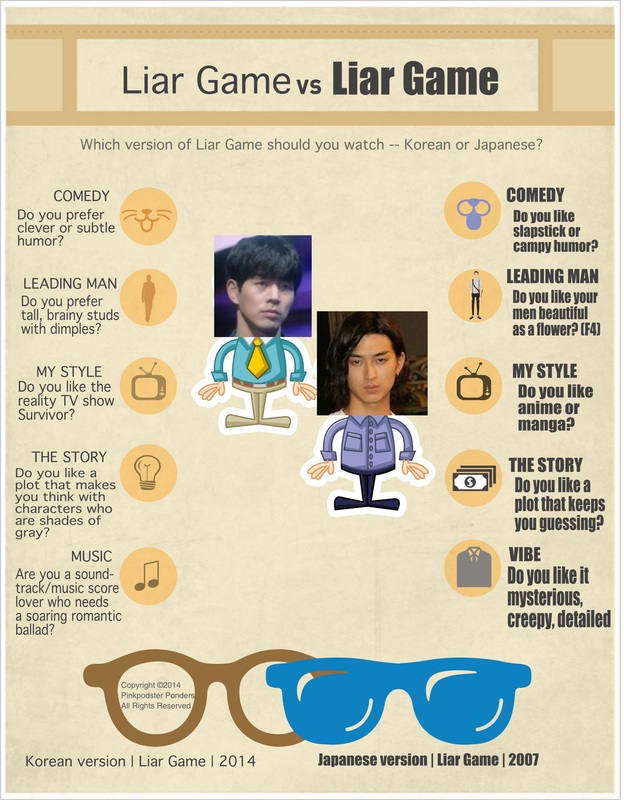 Whether you prefer the Korean version or the Japanese version of Liar Game is really about individual taste. Are you enamored with Japanese language and culture? Are you a fan of manga? Do you like your side characters somewhat anonymous and unattractive character actors? Or are you enamored with Korean language and culture? Do you prefer a mostly attractive cast with a few character actors? How innocent must your sweet heroine be? Helpless or just naïve? So many questions, that I decide to create this infographic to help you decide. Either way, if you watch, you win. NaNoWriMo: So, What Did We Actually Write in November?